Many people write these wee guys off as there seems to be a false belief out there that mushrooms don’t provide many, if any nutrients – I used to be guilty of thinking this. The fact is mushrooms are mystic organisms that have a world of delicious goodness to offer. 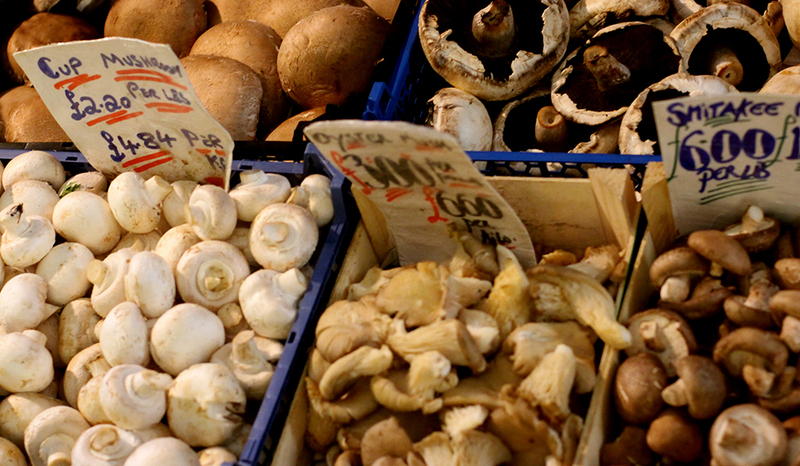 Ancient Egyptians believed mushrooms were the plant of immortality. Pharaohs classed them as a royal food and commoners weren’t even allowed to touch them. The Romans held a firm belief that mushrooms gave their warriors strength, and so the soldiers ate them before battle. Eastern cultures have celebrated the health benefits and healing properties of mushrooms for thousands of years, and it turns out they were on to something. Often mistakenly grouped with vegetables, mushrooms are actually a fungi – a special bunch with their own kingdom separate to plants, animals and bacteria. Genetic studies have shown that fungi cells are more closely related to animals than to plants, this is why mushrooms have many of the same nutritional qualities as plants, as well as characteristics more commonly found in meat, beans or grains. In short, mushrooms are a fascinating and delicious food with a lot to offer. Mushrooms provide our bodies with the nutrients, proteins, minerals, and vitamins it needs to generate energy and repair cells. But the big benefit is that they are high in antioxidants, selenium, riboflavin and other healthy substances that protect and boost the immune system, helping our bodies fight free radicals that can cause cell damage and DNA mutation. Mushrooms are one of the richest, natural sources of selenium, an essential mineral which works as an antioxidant to protect body cells from free radical damage that could lead to heart disease, some cancers, chronic illness and other diseases related to aging. Many animal foods and grains are good sources of selenium, but the mushroom is one of the richest sources of selenium in the produce aisle, which is good news for vegetarians, whose sources of selenium are more limited. Mushrooms are well known for their immune-boosting properties – so much so that one of the most powerful nutrients in shiitakes is approved as an active ingredient in a mushroom-based anti-cancer drug used in Japan. Regular ingestion of mushrooms over long periods of time has been proven to decrease the amount of cancerous cells in the body. They not only fight and reduce cancerous cells and tumours, but they help to prevent more of those cells from forming in the body. 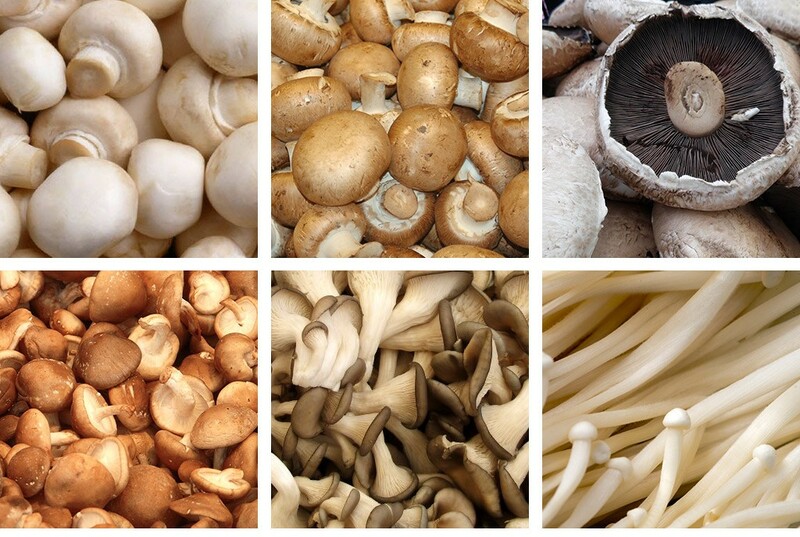 On top of that, mushrooms are low in carbohydrates, calories, and sodium and are cholesterol and fat-free. They’re also high in fibre and protein and rich in B vitamins, which help to maintain a healthy metabolism. Mushrooms are considered the exception to the rule that plant foods don’t naturally contain vitamin D, which is essential for healthy bones and teeth. If mushrooms have grown in the sun or under UV light, then they actually absorb the vitamin D, which can then be absorbed into your body. Clockwise: The white button mushroom, the versatile crimini or “chestnut”, the meaty portabello, and the wild enoki, oyster and shiitake mushrooms. Another cool fact about mushrooms is that their taste belongs to a “fifth flavour”, beyond sweet, sour, salty and bitter, known as umami, from the Japanese word meaning “delicious.” Umami (pronounced oo-MAH-mee) is described as a savoury, brothy, rich or meaty taste sensation. The beauty of mushrooms is that they are easily available and affordable, so it’s easy to include them in your diet and enjoy the nutritional (not to mention flavoursome!) benefits they offer. Although vitamins are also found in many vegetables, they are lost when cooked in boiling water. As mushrooms are rarely prepared with boiling water, they retain their valuable vitamin content when cooked.